Inspired by the Highwaymen who painted and sold Florida landscapes in the 1960s and 1970s, I also want to capture the natural beauty of undeveloped Florida in oil landscapes. Artists can bring great awareness to their native states by using their environment for inspiration. Just as Grant Wood did for his state of Iowa and Thomas Hart Benton for Missouri, I love to paint the scenes I know best in my home state of Florida. The creative process and natural scenery of Florida are complementary partners. The wind-bent palms, mangrove swamps, hammocks, and lush preserves of palmetto and pine give Florida its rhythms, lines, shapes, colors and movement. The undeveloped coastline, lakes, and rivers are made vibrant by the sunlight which creates patterns of light and shadows. Billowing clouds and thunderstorms add to a constantly changing sky. A painting idea starts with a visit to an undeveloped area, a preserve or a state park, usually near the Intracoastal Waterway. I take many photos and do a few sketches. Then I pull together from the photos a composition which best represents the area. I also set up my easel and oil paints outside to paint "en plein air" on good days. When i enter the "zone", I paint all day before I notice the sun setting! The results are what I would consider "contemporary impressionism". 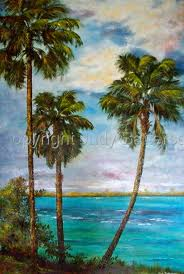 These paintings relate to one subject - Florida in its natural state. As a native Floridian, I have a passion for everything that is indigenous to this land "where palm and pine are blowing, where southern seas are flowing," so aptly described in the University of Florida alma mater. To be in a symbiotic relationship with this environment is to have a desire to preserve it. And I can preserve it best by capturing it on canvas!